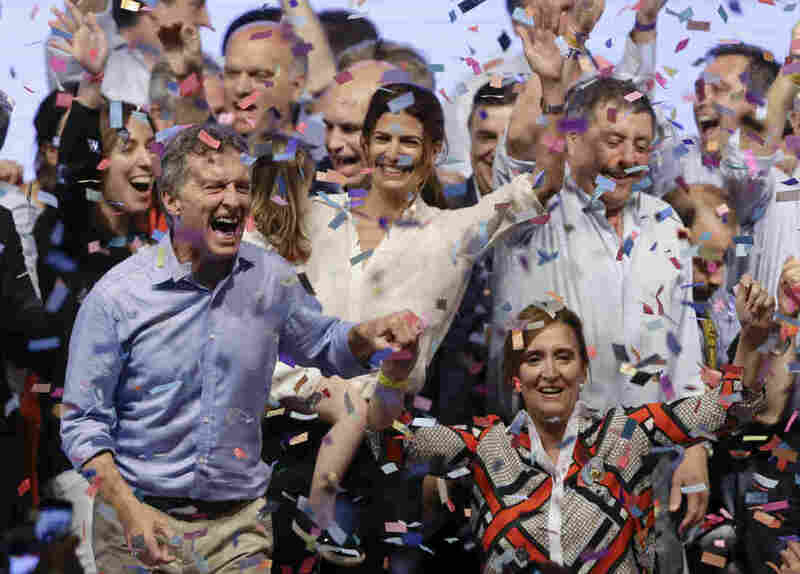 Argentina Elects Opposition Candidate As Its Next President : The Two-Way The win by Mauricio Macri ends the 12-year rule of Cristina Fernández de Kirchner's Peronist Party. Macri, the former mayor of Buenos Aires, promised to roll back some of Kirchner's policies. Opposition presidential candidate Mauricio Macri, left, and running mate Gabriela Michetti celebrate after winning a runoff presidential election in Buenos Aires, Argentina, on Sunday. Mauricio Macri, the former mayor of Buenos Aires, will be the next president of Argentina, after a close election that brings the 12-year rule of the Peronist Party to an end. "This is a politically polarized country and it was a hotly contested race. For the first time ever in Argentina's history there was a second round of voting in a presidential election. "In the end though, the man advocating change Mauricio Macri won it — and decisively. "Now comes the hard work say analysts. Argentina has chronic inflation, an unstable currency and a fight with hedge funds in New York has locked it out of accessing international credit. "The new president is the former mayor of Buenos Aires and was also the head of a popular football club. He's promising to push Argentina in a new direction. Macri is right of center and he is promising to do away with some of the policies of current President Cristina Fernández de Kirchner." Macri beat Daniel Scioli, who was hand-picked by Fernández de Kirchner, by about three percentage points. The BBC reports that Macri made economic reform the priority during his campaign, but did not add much detail about what's to come in his victory speech. "The son of one of Argentina's richest men, Mr. Macri had a long career in business before entering politics. "In 1991, he was kidnapped and kept captive for 12 days by a gang of corrupt policemen demanding millions in ransom. "Four years later, he became president of Boca Juniors Football Club and used his success at the club as a springboard for his political career."